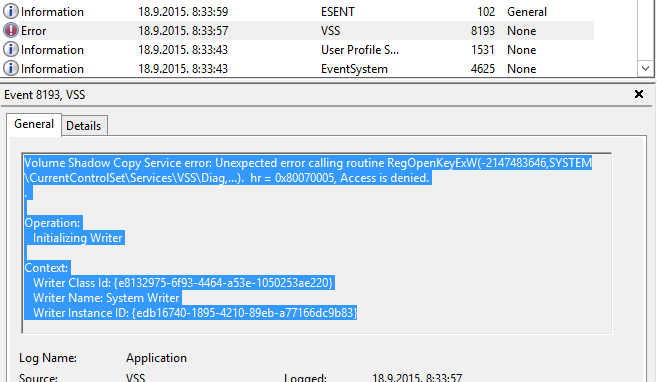 If you have this error you probably installed DHCP server role on your server. Very detailed explanation and solution you can find on Microsoft link https://support.microsoft.com/en-us/kb/2298620 It is the same for Windows Server 2012/2012 R2 version. 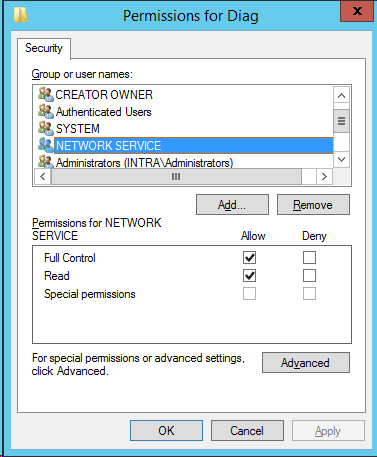 If you want to keep things simple all you need to do is add Network Service account on this registry key HKLM\System\CurrentControlSet\Services\VSS\Diag . After you give it full permission this error will be gone. ← How to install Putty with PowerShell? Do you know how I can repeat the issue to check that my change fixed the issue? How to add Network Service account as a DWORD QWORD? What will be the value of it..” could you pass some more info please?